Dave Challinor was forced into making several changes from the last league outing at Bromley. 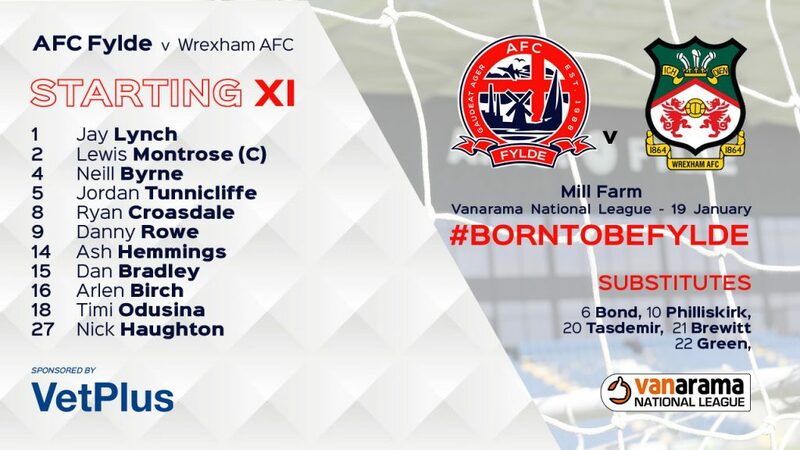 The injured duo of Zaine Francis-Angol and Luke Burke were replaced by Arlen Birch and new loan signing Timi Odusina. Dan Bradley made his first start for the club since his return from National League North side, Kidderminster Harriers. Wrexham made three changes from their last league match – Oswell, Young and Jennings were replaced by Carrington, Walker and Beavon. It was a frantic, end-to-end start to the match at a bitterly cold Mill Farm. Wrexham’s Akil Wright had a free header at goal directly from a corner kick in the opening ten minutes, but Jay Lynch was equal to it in the Fylde goal to keep the ball out. Minutes later, Nick Haughton’s wonderful driven corner kick from the left-hand side was just about cleared away from Wrexham’s skipper, Shaun Pearson. After 20 minutes had passed, Akil Wright had another opportunity at the Fylde goal. With the ball at his feet, the visitor’s number 20 worked some space on the edge of the area, and took a shot at goal – but Lynch was there again to get down low and hold onto the effort. At the other end, Danny Rowe had a powerful effort from distance saved by Lainton, only for the goalkeeper to spill the ball out to Ryan Croasdale, but the central midfielder was in an offside position and the visitors were awarded a free kick. With ten minutes of the first half remaining, Rowe attempted the spectacular again. A lovely ball from Haughton to the far post was met by the Coasters number nine on the volley – but the ball whistled over Lainton’s goal at some speed, to go out for a goal kick. Then, with just 90 seconds of the first half remaining, Ashley Hemmings broke the deadlock. Nick Haughton weaved through the Wrexham defence to find space, only for Wrexham’s Jake Lawlor to get to the ball before Haughton could shoot. The half-hearted clearance only went as far as Hemmings, though, who’s powerful first time effort went through Lainton and rippled the back of the net to give the Coasters a half-time lead. Fylde had a fantastic opportunity to double their lead in the opening seconds of the second 45 minutes. Dan Bradley went for glory with a first time effort, but the shot was saved by Lainton and the ball bounced clear. Then, with 55 minutes gone, the Coasters made it 2-0. A fantastic counter-attacking move following a Wrexham corner kick gave Ashley Hemmings the space to shoot from the corner of the area and the ball nestled into the far corner, sparking jubilant scenes across Mill Farm. The visitors pushed to find a way past Jay Lynch, and with an hour gone, Luke Summerfield had a good effort from distance saved well by Jay Lynch, to maintain Fylde’s deserved two-goal cushion. Danny Rowe, who had had a quiet afternoon in comparison to his regular high standards, tried an ambitious effort from almost halfway after spotting Lainton off his line. However, the effort went just wide of the post. 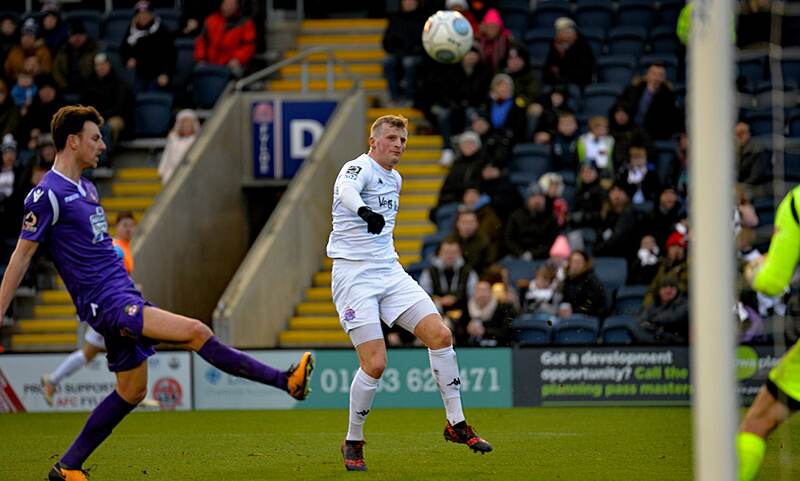 The final opportunity of the match fell to the visitors in added time, and they would have halved the deficit had it not been for the heroic efforts of Jay Lynch in the Fylde goal. A first time effort from substitute, Rekeil Pyke was heading for the far corner, but Lynch was there to punch the ball away expertly to his left and keep his clean sheet intact. Ultimately, the afternoon belonged to Fylde, picking up a crucial three points to stay in touch with the sides at the top of the division. The Coasters remain in fourth position, with a trip to third-placed Solihull Moors next up, in a crucial week for Dave Challinor’s men.